We have another new feature to announce to add to our recently released industry classification: Spam scores provided by a fresh install of SpamAssassin. If you’re not aware, SpamAssassin is a widely used, open source spam filter which gets automatically updated with new rules based on information it gathers from mailservers around the globe. We’re in the process of rolling spam scores out to all our emails. 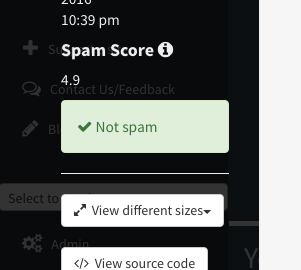 If a spam score is available for an email, it will be shown on the left hand side when in the email view. See the screenshot below for an example. The default configuration of SpamAssassin considers any score above a 5.0 to be spam. This will be reflected in the box under the score, for the information at a glance. You can also see the average spam score for your search in the analytics panel! Check out the next screenshot to see what that might look like. While the spam scores are still being worked out, you may see some emails without a spam score. These will be added soon.